Higher patient satisfaction with a lower cost. Fewer physician visits, less pain, and quicker recovery. And, at a reduced cost to the patient because the procedure can be performed in the doctor's office instead of a hospital or surgery center. Trigger finger is a common condition that affects hundreds of thousands of people each year in the U.S. 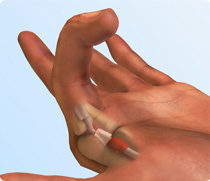 It occurs when the tendon in the finger becomes inflamed, often due to repeated "gripping" actions, and can no longer pass through the tendon sheath, much like fishing line passing through guide rings on a fishing rod. The finger can become "locked" in an up position or may produce a snapping sound, therefore the name "trigger finger". How can Trigger Tome Help? Trigger Tome® has been specifically designed to make the surgeon's job easier, faster, and more accurate. 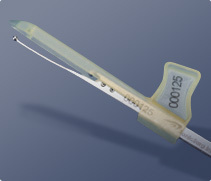 The "release" procedure, which requires cutting of the tendon sheath, can be done the same day the patient presents the problem to their physician in only a few minutes. The incision is smaller than current protocol resulting in less pain and faster recovery. Company founder, Brian M. Jurbala, M.D., is a board certified orthopaedic surgeon specializing in sports medicine and upper extremity procedures. He has treated hundreds of patients afflicted with trigger finger and is committed to providing a simple, effective and economic solution to this common problem.